Mrs. Jeanelle Thomas Gage, age 86, of Griffin, passed away Sunday, March 31, 2019 at Brightmoor Hospice. Mrs. Gage was born in Griffin, Georgia on November 17, 1932. She is preceded in death by her parents, Hulette and Betty Davenport Thomas; her husband, Kenny Gage. 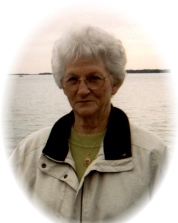 She was a member of Griffin First Assembly and was retired from the Daycare at the church. Even though she and Kenny never had children, she had a hand in raising and molding the lives of many children by teaching them about Jesus. Survivors include sister, Louise Vaughn and Shirley Hooks, many nieces and nephews. It was Jeanelle’s wish to have her service of remembrance on a Sunday morning at Griffin First Assembly, the church that she loved so much. Dr. Randy Valimont and Pastor George Jacobs will officiate this Sunday morning, April 7, 2019 at 9:30 am in the sanctuary. As Jeanelle has already been buried beside her husband at Westwood Gardens; she requested that you please omit flowers, and instead honor her memory by contributing to the Mission’s Fund at Griffin First Assembly, 2000 W. McIntosh Rd., Griffin, Georgia 30223.